If you are the Redmi Note 5 Pro users then you heard about the Anti Roll features, which Xiaomi implemented for the Redmi Note 5 Pro MIUI 10 users. Which means that after applying the MIUI 10 OREO updated you can’t downgrade to the previous version or you can say that you can’t go back to the MIUI 9. If you tried to do so your Redmi Note 5 Pro will be bricked. Xiaomi added Anti-roll-back to latest Stable/Beta ROMs, and after this many user already bricked their phone while downgrading. So today in this we will tell what is this Anti-Roll-back and in which MIUI Version are affected with this, And how to Downgrade Redmi Note 5 Pro MIUI 10. A few days back Xiomi implemented this rule only for the Redmi Note 5 Pro users, and most of the users are not happy with this. As per the Xaiomi, the reason to implement this feature on the Redmi Note 5 pro is to maintain system stability and ensure the security of the device. If you have updated to MIUI 10 Beta ROM released after July 6th, please don’t try to downgrade your ROM to previous Stable ROM and Beta ROM. If Otherwise, your device will be bricked. So in case if you are not happy with the MIUI 10 Beta builds and want to downgrade Redmi Note 5 Pro MIUI 10. Here is the full guide which you can use on your phone and downgrade your phone. Here we are using a modded version of the MIUI ROM or you can say Miui ROMs without firmware. All credit goes to the XDA developer AL_IRAQI for releasing these Modded versions of MIUI ROMS. By using this moded version we downgraded our MIUI 10 8.7.12 Redmi Note 5 pro to MIUI 9 Stable 9.5.14, and that too without bricking the phone. The Proof is in the video which you can find at the end of this guide. 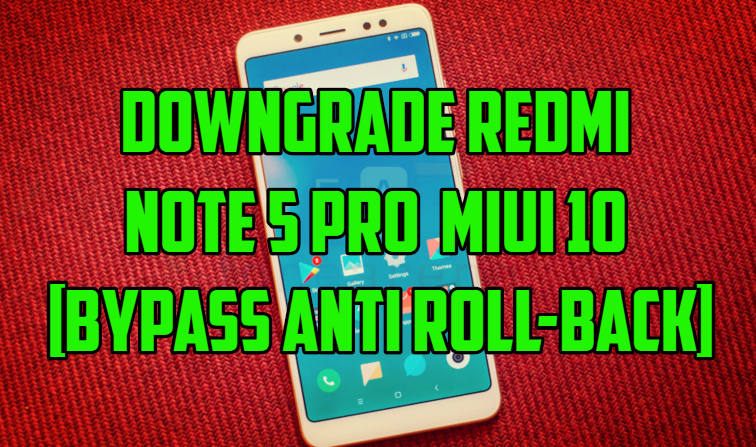 So let take a look how to o Downgrade Redmi Note 5 Pro MIUI 10 and ByPass Anti Roll-back. As per the Xaiomi Announcement, the new Verified Boot changes in Android 8.0 Oreo will prevent a device from booting should it be rolled back to an earlier firmware. The new feature is called Rollback Protection. So if your phone is flashed with older software, you (and your data) are protected from whatever potential security vulnerabilities may have been present in earlier versions. And if someone tried to roll back your phone will be bricked. 1. If you have updated to MIUI 10 Beta ROM 8.7.6 or above, you can flash all ROMs after 8.7.6 (including 8.7.6), but you can not downgrade to Beta ROM 8.7.5 or ROM previously. 2. If you are on Beta ROM 8.7.5 or ROM previously, you can flash your device using all those previous ROMs. 1. If you are on Stable ROM V 9.5.19 or ROM above, you can flash all Stable ROMs after V 9.5.19 (including V 9.5.19), but you can not flash your device to Stable ROM V9.5.17 or ROM previously. 2. If you are on Stable ROM V 9.5.17 or ROM previously, you can flash your device using all those ROMs. So it means if you are on above MIUI 10 Beta 8.7.5 then you can’t downgrade your phone. And if you are on the MIUI 9 Stable 9.5.19, then you are in anti roll back feature. Don’t think about the downgrade. Anti Rollback started from these versions MIUI 10 8.7.12 and MIUI 9 9.5.19. If you are on these versions, then there is no chance to downgrade. Warning: Technobuzz.net is not responsible for any damage that might happen to your phone during this process. As we mentioned earlier if you want to downgrade than you can downgrade your phone to the previous version with the modded ROPMS. Which comes without firmware and that will not brick your phone. But there is a catch once you go back to the Previous version don’t try to update your phone with OTA update. This will update the firmware your phone and your phone will be bricked. Just stick to the modded versions if you want to use older MIUI builds. You can flash these builds only with the TWRP recovery. Don’t know how to do that check out the video below. If you are facing some problem with this guide then leave the comment below and we will help you to fix it up. have You any idea this will work on Redmi Note 4 Global, 4 GB/64 GB, Android 7.0 NRD90M/MIUI Global Stable 10.1.1.0?